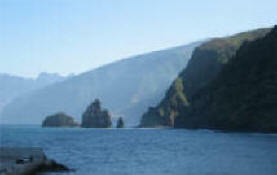 Madeira is a small subtropical island close the African coastline. Madeira, the "Hawaii" of Europe is a nature lovers paradise abundant with exotic flowers, fruits, bushes, fresh water and breathtaking scenery. It is a pleasant place to visit all year around with its flowering trees, year-around pleasant climate, friendly people where English is widely spoken. There are a wide selection of walking tours available along the famous Levadas, the water transportation channels that carry fresh unpolluted rain water throughout the island. These tours will also take you hidden waterfalls or perfect vantage points in its high mountains. Whether you come here in the summer or during your Christmas holidays this snake-free island is always charming and inviting with its scenic beauty, lush gardens, superb fortified wines, safety and security. Arrival in Funchal. transfer from the airport to the 4 star hotel Baia Azul in Fuchal. Rest of the day at leisure. Wellcome dinner with Fado show. (only available on Wednesdays, Thursdays and Fridays). Transfer from the hotel to the boat terminal and boat ride “Go on a boat ride from Funchal to the amazing island of Porto Santo also called Ilha Dourada. Take a guided tour around the island and also some free time to relax, enjoy the beach and get to know this beautiful place!” Lunch included. Boat ride and transfer back to your hotel in Funchal forovernight. 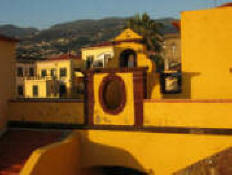 After brekfast your journeytoday starts in Camacha, a beautiful small village a few kilometers from Funchal. Proceed then to Pico do Areeiro, the second highest mountain of the island, with 1810 m altitude, offers amazing views! The tour heads towards the coast, passingthrough villages and stunning seascapes. It follows Ribeiro Frio famouse for it lush vegetation of endemic species of flora and fauna. Free time to enjoy lunch in Santana, the village characterized by its houses with thatched roofs. Set out to explore the amazinglandscapes of Penha d'Águia in Porto da Cruz. At the end drive towards Ponta de S. Lourenço a location that combines rocks, sea and nature. Before return enjoy getting to know Santa Cruz. Today we embark on a half day panoramic tour of Madeira Island with stops in Eira do Serrado, a village surrounded by green mountains. Nun's Valley (Curral das freiras), where you can enjoy a country vision full of typical houses of Madeira and finally Camara de Lobos, a fishing village famous by its typical drink "Poncha". Incredible breathtaking scenery that will ensure an unforgettable experience.” Return to the hotel, free time and overnight. Breakfast at the hotel, then transfer to the airport based on your departure time. End of services. Days of operation: Wednesday and Friday (morning). We will start by presenting you the Old Town, including the Historical Nucleus of Santa Maria dated from 1425, when the settlement of Madeira began. From this period the nucleus still preserves the urban lines, the Chapel of Corpo Santo and a small door in manueline style. Then we visit the Fish Market, where you can see several types of typical madeirian fish like tuna fish, black scabbard fish and parrot fish, and the famous “Mercado dos Lavradores”, built in 1941, where flowers, fruits and fish are sold. In the inner court, you will find fruit and vegetable salesmen, which offer in wicker baskets exotic fruit and vegetables. The flower women in the typical costumes are offering orchids, birds of paradise, flamingo flowers and straw flowers of all colours. Not far from the market is an embroidery factory located. Here you will get acquainted with one of most beautiful handicrafts of Madeira and see how the embroidery is made. You will find here table cloths, napkins, handkerchiefs with monogram, among others, with the guaranteed seal from Madeira. Afterwards, we will visit the Sé-Cathedral, built in the 15th century in manueline style. The next Stop is in the Botanical Garden where you may enjoy a magnificent view over Funchal from the different sightseeing points. Here you can find, besides orchids, an enormous amount of tropical and subtropical plants from all over the world. To conclude, we will visit a wine cellar, where you have the opportunity to taste the famous Madeira Wine. In a restaurant in the outskirts of Funchal you will taste the famous Espetada, beef on skewers, served with crispy fried corn. There won’t be missed the typical round and flat bread made of wheat flour, from Hebraic origin, cooked over a basalt stone and traditionally covered with garlic butter - the bolo do caco. During dinner, you will get acquainted with the folk Madeirian culture through the performance of a folklore group. After dinner, we will stop in a magnificent view point to enjoy the panorama over the fabulous amphitheatre of Funchal. The walk starts in Pico do Arieiro (1.818m), the third highest of the island and ends in Pico Ruivo (1.861m), the highest of Madeira. The ground till the top is covered by slabs of basalt ripped from the encircling rocks by the force of the ice, introduced in its fissures over thousands of years. The vegetation throughout the ascent is poor, being dominated by broom bushes and the bracken. The ironwort, known as Selvageira or Erva Branca, is the only endemic species with presence amongst these bare rocks. If the weather allows, it is possible to enjoy a magnificent view over Madeira, Porto Santo and the Deserted Islands. From Pico Ruivo we walk down till Achada do Teixeira in Santana. Return to the hotel after a light lunch (inclusive). The walk starts 650m high through the eucalyptus and laurels. The horizon opens itself giving us a fantastic view over the northern coast and the highlands of Madeira. After a walk of 2,5 hours it starts the descent of approximately 15 minutes to Portela. In Bica da Cana, we start a walk of approximately 20 minutes that leads us to Rabaçal, the departure point of the walk, starting by visiting Risco. The path is flat and just a few minutes later we will be standing before an impressive landscape, impossible to imagine finding when crossing the monotonous and harsh surface of Paúl da Serra. After absorbing enough the landscape of Risco, we continue our walk and just over an hour after starting the walk we get to 25 Fontes, a small lagoon surrounded by dense vegetation into which spill the waters of a series of fountains located on the nearby rocks. After a small break we continue through a tunnel in the direction of Calheta, where the lunch will be served (inclusive). We follow along the south coast in the direction of Europe’s highest cliff, Cabo Girão, and then we continue till Quinta Grande. Over the first stretch of the walk, we may register marvellous views over the vast area extending from Câmara de Lobos to Funchal. During the levada, we may also appreciate the houses in a rural landscape and the sea. Return to the hotel after the lunch (inclusive). The walk starts in Baía d’Abra, the largest and most spectacular bay of Ponta de São Lourenço. The Ponta de São Lourenço presents itself as a great contrast to the green we find all over the island. The lava rocks are impressing, rising up from the ocean. Return to the hotel after a light lunch (inclusive).